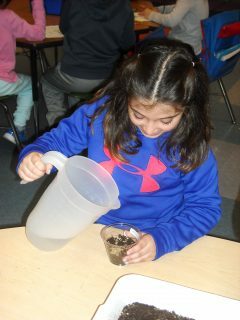 This first-grade student at Cherry Lane Elementary School is adding water to a clear plastic container that consists of rye grass seeds and potting soil. It was expected that in five to seven days, the seeds would sprout roots and grow hair-like stems. Last Friday, Earth Day aimed to motivate awareness and appreciation of the globe’s environment. According to the website timeanddate.com Senator Gaylord Nelson founded Earth Day in 1970 to promote ecology, respect for life on this planet, as well as to encourage mindfulness of the growing problems of air, water and soil pollution. – At Cherry Lane Elementary School, first-grade teacher Kelly Hidalgo told the students that they were going to plant rye grass seeds in clear plastic cups. She elicited from the children that in order for the grass seeds to germinate, they had to be planted in potting soil, be watered and placed in the sunlight. It was expected that in 5- 7 days, the seeds would sprout roots and quickly grow hair-like stems. Teachers Elio Ficarella and Karen Mena are standing on either side of the sixth-grade Green Team members, who served as bucket-monitors for the collection of student food scraps at the end of the lunch period. – At Suffern Middle School, teachers Elio Ficarella and Karen Mena described the sixth grade Green Team’s composting project. Each day students and cafeteria workers generate pounds of materials, such as food scraps. Composting is a natural recycling process that uses decomposition to break down food scraps. With the help of beneficial organisms, the organic debris is broken down to form a nutrient-rich soil complement. A bucket was placed in the kitchen to collect food preparation waste, such as fruit peels, lettuce cores and vegetable pieces. After lunch, students in the sixth grade cafeteria scraped their food waste into small pail manned by Green Team monitors. The collected food waste was then dumped into a backyard black plastic dome, so that the resulting compost could be used in the school garden. Fifth-grade students Hannah and Wyatt are participating in Keep Rockland Beautiful’s garbage recycling activity at Strawtown Elementary School. The students raced to deposit garbage in the proper recycling containers. – At Strawtown Elementary School, fifth grade students participated in Keep Rockland Beautiful’s Basic Environmental Awareness Training Activities, such as the ‘garbage recycling relay.’ It was an interactive activity where the students raced to deposit garbage in the proper recycling receptacles plus learned about the many benefits of waste reduction. This planet is our home and all of us need to work to keep it environmentally healthy for a secure future.